Each day I get up and work that 9 to 5. Really its 7am to 4pm and that's way too early if you ask me. Since jumping into the world of essential oils and their emotional healing properties I've found a few oils that are my must haves for the work day. I need motivation, energy, security, and balance each day since I work in a job that tends to be way too go go go for me. There was a time, and often there still is, that my job becomes way too much for me. In the past I've had mental breakdowns over stress. This is not a healthy way to live. While I'm great at my job, the environment is simply plagued with unneeded stresses due to the fast paced nature of our work. I am also an extremely emotional person. My emotions can get the best of me and I'm only just now really able to understand them, work with them, and work through them. I started to work with meditation, Tarot cards, and essential oils as a way to help myself work through & understand my emotions. Essential oils aren't magic. You have to be open to what they can do for you in order to really benefit from them. Each oil does have inherent properties - lavender is inherently soothing - but it is our association that helps us most of all. I find that certain essential oils help me get into the headspace I'm looking for through out the work day but that is only because our sense of smell & association is very powerful. When a scent is constantly used to correspond to an emotion/feeling/etc, that association becomes very, very strong. So if you want to sink into a certain headspace, your sense of smell in important. When you start to work with essential oils, embrace each scent for what it's properties are. Imagine being in that headspace. Imagine what the properties of that oil feel like to you - Where does the scent hit you? Can you feel it in a certain chakra? Can you feel it in a certain area of your body? What does the scent remind you of? Once you start to build these associations it will become easier to move into that headspace when you work with the oil. This blend does exactly as it says! Motivate is a blend of both citrus & mint oils that invigorate, plus other supportive oils (Basil, Rosemary, & Coriander) that help against burn out, fatigue, and expression of the true self. Right off the bat, the smell is minty, thus supporting energy (I'll talk about Peppermint and energy below). Then it hits on the citrus notes that instantly pull you into a space of I can do this. Citrus oils are know to be uplifting. Rounding out the rest of the scent is vanilla. I'm not to fond of this part of the scent but doTERRA adds vanilla bean extract to some of their blends to add a sweeter kick. I usually leave this oil uncapped on my desk allowing the aroma to permeate my immediate area. Often I will inhale from the cap as well when I feel I need a little more boost of energy. Personally I carry a pack of the Peppermint Beadlets with me daily. The menthol content in this oil is known to freshen - much like peppermint would be used in a toothpaste or breath mint - so these little buggers are perfect to freshen breath after lunch. Peppermint also has an energizing quality that I can speak to first hand. When I'm feeling particularly bogged down I pop one of the beadlets in my mouth. The sudden, refreshing & cooling mint flavor I think is what gives the quick kick of energy. Pair this with the Motivate blend and you've got double the feeling of energy! This roller bottle blend is bright, fresh, and sweet. It works great as a Solar Plexus and Sacral Chakra oil as it stimulates feelings of hope. This a blend of my favorite uplifting oil Bergamot (mentioned in detail below) + Ylang Ylang and Frankincense, and finished with a touch of Vanilla extract. This is a truly supportive blend and I wear iwsut as a perfume. It is currently the essential oil I am working with this lunar cycle as I work towards self care! This blend is perfect to fit in self care in the office anyway. Bergamot is my favorite Solar Plexus Chakra oil. This is the citrus-y-est oil yet...and I love it. While you can take this guy internally, it does not taste that good (found that out on accident!) so my preferred way to work with this oil is aromatically. 9 times out of 10 I've got this oil in my diffuser necklace from Origami Owl. This oil really gives me the boost of I can do this! Being that it is the perfect Solar Plexus oil, it really promotes feelings of support, confidence, and optimism. This is my Happy Oil, quite literally. I've used it in this recipe over in the Five Sixteenths | Live Creative group and created this Howlite & Lava Bead diffuser bracelet here. This is one of the first oil blends I started to work with on my spiritual path towards balancing my emotions. How fitting for this oil. For me, this oil is both a Root Chakra and Crown Chakra oil. Because I am grounded I am more open to working with myself. This oil blend has both Spruce and Ho Wood oils that promote a feeling of rootedness in the present moment. The great analogy here is that trees are not in a hurry, they are stable, they are grounded, and they are persistent. Another oil in this blend is Frankincense which is an oil that allows us to open our Crown Chakra to the divine. Through this groundedness in the present moment we are able to hear where we are being guided. And if you're wondering if you'll look weird with a few bottles in your purse & on your desk, the answer is probably. Will people walk past your desk and comment on it? Yes. Mostly the reaction I've gotten is supportive & I love talking with others about the oils. If you're worried someone will find you weird for doing this...push that out of your mind. Your self care & sanity is more important than any side eye! Let your essential oil flag fly. So those are my top 5 oils for the work place. 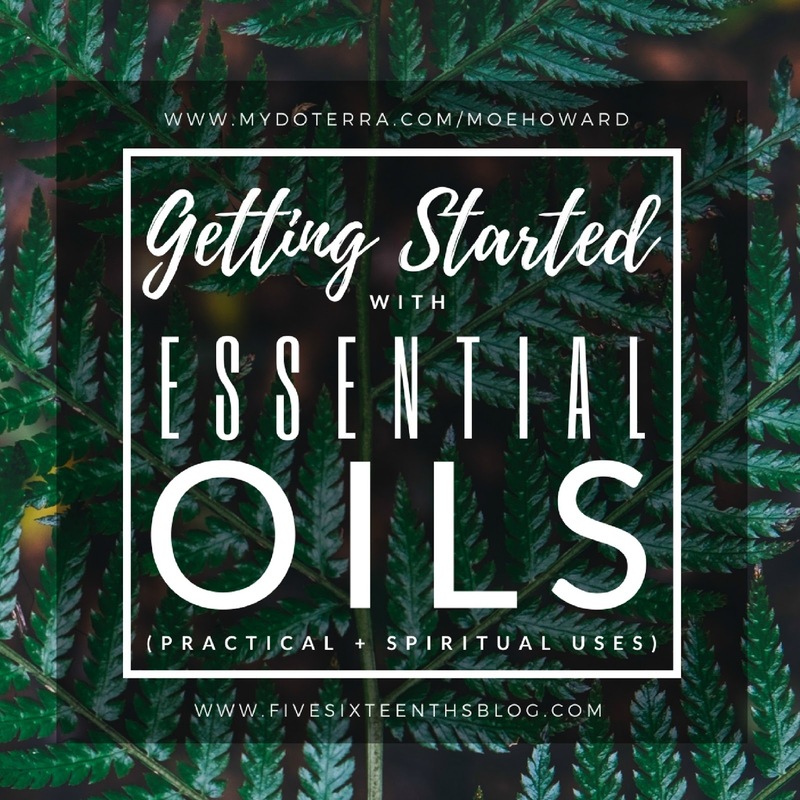 If you'd like to get started with both the practical and spiritual uses of essential oils, check out my FREE ebook Getting Started with Essential Oils - Practical & Spiritual Uses. I go over 10 oils that will help you perfectly dive into this oily world of wellness. And if you'd like to take the leap to become a doTERRA wellness advocate & work with me on your spiritual journey I'd love to offer you a free gift - a digital copy of my favorite guide Essential Oils & Emotions + a 10ml roller bottle of Hope. Click here to send me an email if you're interested! Do you use essential oils in your workday routine? How have essential oils helped you with your emotions?